Replacing a single missing tooth with a dental implant offers many advantages over your other choices: a removable partial denture or fixed bridgework. A dental implant stays securely anchored in your jaw, giving you a replacement tooth that looks, feels and functions exactly like a natural tooth. A partial denture, on the other hand, needs to hook onto existing teeth. This added stress may cause the anchor teeth to become loose over time. Fixed bridgework, likewise, presents problems for the natural teeth that are used as supports: In order to hold a bridge in place, we need to prepare or file down and crown (cap) at least two natural teeth, one on either side of the space left by a missing tooth. This may cause those support teeth to become more susceptible to decay. 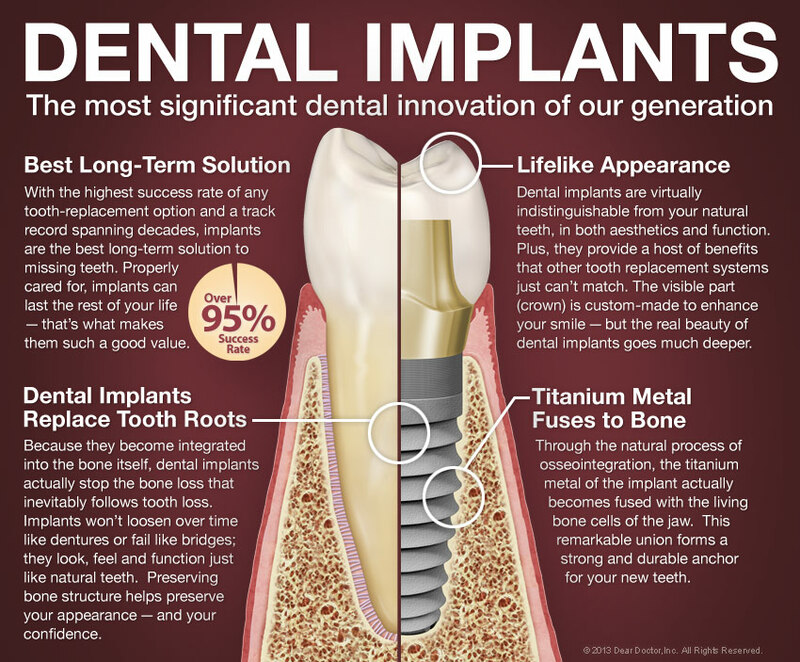 Implants can never decay because they are made of titanium, a highly biocompatible metal. 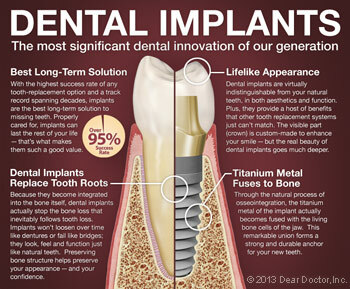 The titanium dental implant becomes the root-part of your missing tooth. During a minor surgical procedure, it is placed beneath the gum, into the jawbone. Over the course of a few months, it will actually become part of your jawbone by fusing to it in a process known as osseointegration. That's what makes implant teeth the most natural replacement teeth that exist today. 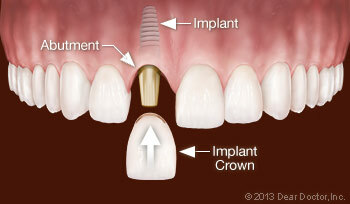 The implant will be capped by a dental crown that has been created to match your existing teeth. Often there is a connecting piece that goes between them called an abutment. Like the implant itself, this part won't be visible in your mouth. Only the lifelike crown can be seen. Sometimes a temporary crown is attached at the same time as the implant is placed so that you can go home that day with a replacement tooth. More commonly, the implant is left undisturbed for several months to complete the osseointegration process before the crown is attached. We will let you know which method would work best in your case. Implants are forever, so we want to make sure it's done right! The surgery to place a dental implant is a simple, routine procedure carried out under local anesthesia in the dental office. First the area will be numbed so you won't feel a thing. Then the implant will be inserted into your jaw at a precisely planned angle and position to maximize support for your new tooth and avoid anatomical structures such as nerves and sinus cavities. The surgery should take an hour or less, and post-operative discomfort should be minimal. Many patients find over-the-counter anti-inflammatory medication such as ibuprofen or acetaminophen is all that is needed; others find they don't need to take anything at all. It will be important to avoid chewing on the surgery site for several weeks; we will advise you as to any diet modifications you need to make during this time. Once your permanent crown is attached, your new implant tooth will feel just like all your other teeth, and that's exactly how you should care for it — as if it grew there naturally. While it cannot decay, the implant's connection to your bone can be threatened by gum disease. In order to avoid this, keep up your regular oral hygiene routine of brushing, flossing, and coming in for regular professional cleanings. If you keep your mouth healthy, your implant should last a lifetime.